It’s an informative and essential read for any higher-education institution looking to launch, grow, and improve its online learning efforts. With three years of data and a growing sample of participants, CHLOE provides a wide-ranging view of how online learning is evolving and where schools are focusing their efforts to improve quality and student experience online, broken down by institution type and size. The whole report is worth reading closely, with extensive data on enrollment trends, the competitive landscape for online learning, the prevalence and growth of online and blended learning, online course design and its impact on student engagement, and the evolving institutional leadership and governance structures for online learning. ExtensionEngine was proud to sponsor this year’s report. We’ll be participating in a panel to discuss the report and brainstorm about how to improve it for next year at the Quality Matters East Regional Conference in New York City on April 25-26, 2019. Unsurprisingly, leaders of online learning programs are mindful of increasing competition, though their perceptions of the source of that competition vary by institution type, scale, and geographic reach. In this year’s CHLOE, a majority of chief online learning officers from all categories of providers — two-year community colleges to large, national online schools — expect competition to increase. This sensitivity to ongoing and intensifying competitive threats is likely to drive further efforts around program differentiation, quality improvement, price competition, and more-aggressive marketing. In our work at ExtensionEngine, these are all issues of real concern to our partners, who know they cannot launch and sustain successful programs without a value proposition built around a distinct student experience, clear return on investment, and effective marketing. 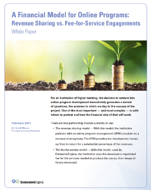 Read our perspective on competition in a response to SUNY's Request for Information (RFI). As the report makes plain, we are well past the early days of online learning, when scheduling flexibility and the convenience of asynchronous coursework were sufficient to draw strong enrollments. To compete now, schools must differentiate their offerings through quality and strength of the overall student experience. According to the CHLOE results, there is a strong correlation between the use of instructional design professionals and the diversity of instructional activities in an online course or program. The more involved instructional designers are, the more immersed students are in a variety of learning activities. Such engagement is often a precursor to improved performance and learning outcomes. In many institutions, online learning is often still a mere shift in how traditional teaching practices are delivered rather than a more transformational reconsideration of how technology enables effective and engaging learning. Resource constraints are most likely the culprit, with many smaller schools and newcomers to the online space struggling to fund investments in instructional design. As the evidence of the positive effects of instructional design mounts, however, it seems likely more schools will prioritize such investments to keep pace with the competition, and baseline expectations for online learning will evolve. A particularly interesting and welcome part of the report addresses the still under-studied issue of institutional governance and leadership around online learning. As we emphasize to our partners, even the best content, technology, and marketing will not yield sustainable success without strong internal capacity to manage and continually adjust to the challenges of online learning. 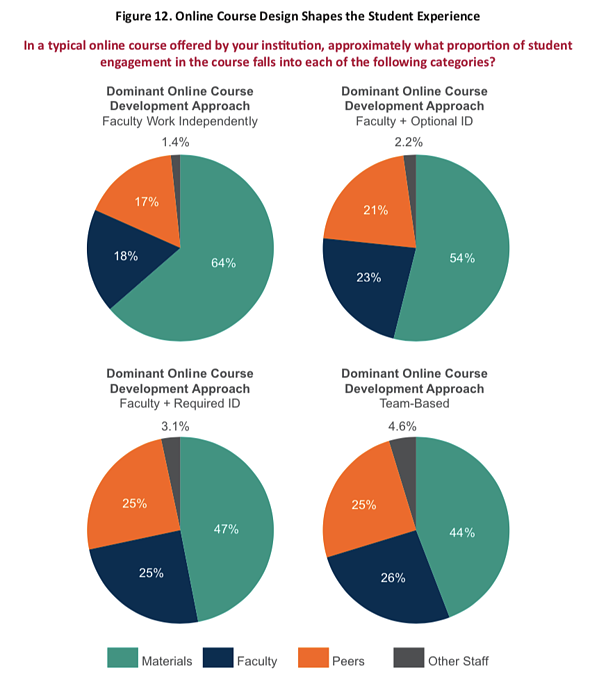 According to CHLOE, more than 90% of the institutions that responded to this year’s survey have a chief online learning officer or a similar point person designated to oversee the wide range of online-related activities — including technology, course development, marketing, finances, faculty support, and student services. Surrounding them, there's a growing infrastructure of committees and councils, albeit with authority generally limited to an advisory role. This reflects a meaningful shift in how important — and, in fact, central — online learning has become to higher-education institutions’ strategy, as well as their near-term fiscal health and sustainability. Even if these committees remain advisory, they indicate an emerging governance capacity that will mature into critical capacity to drive online growth and progress in outcomes. At ExtensionEngine, we help our partners design and implement the business and operational model needed to launch, sustain, and grow online learning experiences — learn more about these services here. In short, online learning is less and less someone's side job or secondary responsibility and more and more a key driver of institutional strategy. There’s much more data on these and other topics in the report, so check it out. And join us in New York City on April 25-26 to discuss this year’s CHLOE and help shape plans for next year’s.